I saw Josie first, even though she was my sister’s Patti Playpal, a doll the size of a three-year-old child. I saw Mom stuff her in the back of the linen closet, wrapped in one of the brown army blankets Dad brought home from WWII. Mom made me promise not to tell my soon-to-be nine-year-old sister about it, as if being five wasn’t old enough for me to know that Debbie’s birthday present was supposed to be a surprise. I coveted that doll and begged for one of my own. When Mom and Dad told me they’d match my money if I saved to buy my own Patti Playpal, I spent the summer digging up dandelions, pairing clean socks from the clothesline, and sudsing up bumpers and hubcaps whenever Dad washed the station wagon. My allowance stayed in the piggybank when the Good Humor man drove down our block on sticky summer nights, and I only got popsicles if Mom passed out nickels for an after-dinner treat. By late fall, I’d reached my goal: three dollars and fifty cents–half the price of the doll. Patti was waiting in the back seat one afternoon when Mom picked me up from ballet. I was too excited to mind that she hadn’t taken me to the store with her to choose. Now I had a doll to sit on my bed, too. I loved her blue eyes and rosy cheeks. I loved her even if her blond hair was thin and straight, not nearly as pretty as Josie’s. Playing with our dolls involved putting them in clothes I’d outgrown, fixing their hair, and reading to them. On Christmas Eve, Debbie and I dressed Josie and Patti up and stood them by the fireplace to await our company. Mom even let me unwrap one of my presents early–red doll shoes–so Patti wouldn’t have to be barefoot. The following summer, I cut Patti’s blond hair to a Buster Brown bob that I immediately regretted. And once as I tried to wrestle an old undershirt on Patti, her arm came out of its socket. When she came back from the Doll Hospital with a rectangular hole cut out of her back, I looked longingly at the still perfect Josie sitting on Debbie’s bed. When Debbie bought a sophisticated Platinum Blonde Barbie with a short and poofy bubble cut, she let me play with her first Barbie doll, whose long red hair was pulled back into a ponytail. But whenever her friends came over to play Barbies and Debbie shut me out of our bedroom, I had to leave the ponytailed doll behind. I eventually saved up for a Barbie that was completely my own, copying Debbie by choosing a Bubble-cut Barbie, too–only mine was Ash Blonde. The Barbie with the ponytail, though, was always my favorite. Debbie left Barbie dolls behind when she started Junior High, graduating to autograph dolls instead. Her friends signed their names all over the dreamy Dr. Kildare doll that lounged against the bed pillow Josie once claimed. I bet I was the only girl in my third grade class who had three Barbies then–one of my own and two hand-me-downs from Debbie–to play with. I got a big box full of Barbie clothes that Christmas, an amazing wardrobe hand-stitched by Grandma Blackwell. It was a day to remember, but not just because of the clothes. I had come down with tonsillitis during the night and was too sick Christmas morning to even open my presents. I was curled on the sofa, limp with fever as Mom and Debbie sat on the floor beside me and pulled out brocaded evening gowns with shawls trimmed with feathers or mink, exclaimed over velvet skirts and silky tops, and dressed the Barbies in Jackie Kennedy style taffeta shifts with matching coats. With the exception of the pearl trimmed wedding dress, there was two of everything: opera dresses, housecoats, shorty pajamas, beach robes and more. I was glad Grandma had begun her monumental sewing project when Debbie still liked Barbies, because the outfits lured my sister into playing dolls with me again when I was feeling better. We dressed our Barbies to go to ballets, operas and balls, Debbie leading the way with fashion even then. The hours Grandma spent lovingly cutting up old slips and stoles and piecing together scraps of lace and fabric didn’t just make my Barbies the best dressed dolls in the neighborhood. Grandma’s gift gave me time alone with my sister again. Deborah turned sixty-three last week. I brought her to our house for a little party, even though I knew it was going to be hard to get her back down the porch stairs when it was time to drive her back to Wellspring. I figured if worse came to worse, my husband and I could cross our arms into a chair and carry Deborah down, with Jill–Deborah’s companion–and Mom steadying her from behind. After a walk around the gardens, we went inside for cake and ice cream, which Jill fed Deborah between bites from her own plate. Then it was time for the birthday girl to open presents. In truth, Mom and I were the ones doing all the opening since Deborah just stared at the packages, her hands folded in her lap as if waiting for the presents to reveal themselves. I remembered four years earlier on her fifty-ninth birthday, the first since I’d moved her to the assisted living facility in Vermont. Deborah had opened her gifts with great abandon then, barely glancing at one before reaching for the next. “Are there any more?” she’d asked after finishing the pile I’d amassed, my feeble attempt to make up for her usual birthday gatherings with old friends. Friends who still met, friends who mourned the empty space Deborah once occupied and missed the poems she sometimes composed for such occasions. In the four years since, Fronotemporal Dementia (FTD) had crept further into my sister’s brain, stealing her words. Her laughs were grunts, her exclamations a string of vowels. As Mom and I opened her presents in my dining room with Deborah looking passively on, we filled her silence with a running patter like sports commentators working the crowd. Would you look at that wrapping paper? What a bow! The scotch tape’s giving way, the paper parts, and WHAT do we have here? Mom gave her a complete Rapunzel set to go with her other Disney Princesses. When Deborah was still a vice president at Disney, I remembered her talking about the Disney Princess marketing phenomenon, how quickly it caught on for little girls to tour the parks dressed as their favorite characters. Now whole aisles at Walmart were devoted to Disney Princess dolls, costumes, games, and art activities. A few months ago, I bought Deborah her first Disney Princess, a four inch fashion Cinderella doll with MagiClip dresses that even preschoolers could slip off and on with aplomb. I bought it because Deborah liked to hold onto things, because Deborah needed to hold onto things, even when the things were unsuspecting people’s arms or wheelchairs. I bought it because Jill mentioned that Deborah liked to hold the small carved figures she brought back from India years before. I hoped that Deborah would look at it as a token of her years at Disney rather than a toy, a reminder of better times instead of further proof of her brain’s degeneration. Deborah’s eyes had sharpened when I handed her the little Princess doll, and she had given the Cinderella her full attention. Anything that drew Deborah out of the apathetic haze of FTD, anything that stimulated and connected her to the rest of the world, was a triumph, a bittersweet victory. So I combed the super stores and added Snow White, Ariel, Belle, Sleeping Beauty and Tiana to our growing arsenal of ways to stimulate my sister. Jill used the Princess dolls to stage fashion shows and swim parties. When I came to take Deborah to the park, the Princesses might be lounging on handkerchiefs against the sides of their Tupperware pool, or posing in front of a mirror. Whenever Deborah and Jill headed out on the Wellspring bus for a scenic drive, a couple of Princesses would peek out of my sister’s travel bag, waiting to ease her restlessness, her compulsion to move that was sure to come twenty minutes into the trip–the yin to FTD’s signature yang, inertia. I went out on a limb with my birthday gift to Deborah this year. I bought her a toy that wasn’t a nod to her success at Disney, a toy that I hoped would provide one more avenue for pulling her out of the daze that had become the default of her being. I bought her Abby, an eighteen-inch, American Girl-type doll with blue eyes and blonde hair that fell past her hips. A doll who looked like a larger version of Barbie’s little sister, Skipper. “You’re going to think I’ve lost my mind,” I said, passing her birthday bags that held Abby and several outfits. Even though Deborah’s behaviors had more in common with toddlers than adults nowadays, I always worried that some essence of my sister still glowed deep inside, that I might diminish the glow by treating her like a child. Deborah didn’t reach for Abby when I sat the doll on the table in front of her. But she didn’t wander away to stretch out on a sofa, either. She didn’t leave her little party to restlessly roam the downstairs peering into rooms or fumbling with the latches on the doors leading outside. Deborah stayed in her seat and watched closely as we changed Abby into a new outfit, listening as we exclaimed over the hat and matching shoes. When I lifted Deborah’s arm, her fingers automatically clasped Abby around her waist. She bent closer, studying the doll’s face with the same intensity she used to pour into books. Her mouth was open and drool pooled in her lower lip. I caught it as it spilled, an automatic reflex using the quilted bib that had become a critical part of Deborah’s outfits now, one of many I’d sewn in patterns to coordinate with her clothes. I couldn’t linger on the sadness I felt, watching my sister drool like a teething child. I couldn’t linger on the stark contrast of this pathetically vulnerable adult with the confident sister I remembered. My job now was making Deborah’s life as pleasant as possible. Grieving wouldn’t further my cause. “If you want, I can sew clothes for her,” I said, thinking about the three pieces of seersucker fabric that were folded upstairs in my sewing room. I’d bought them so I could make lightweight bibs for Deborah to keep her cooler in the summer months. The first one I sewed out of seersucker was a total bust, soaking through to her clothes after five minutes in the park. I figured I could use the remaining fabric to make Abby sundresses and nightgowns. “Would you like that?” I asked, rubbing Deborah’s back, hating how easy it was for me to fall into a kindergarten teacher voice when carrying on my one-way conversations with her. On the way back to Wellspring, Jill suggested Deborah give her baby a kiss. I glanced in the mirror as my sister obediently bent over her doll. Jill was wonderfully upbeat–playful and fun–and Deborah responded to her well. Even so, I couldn’t help but cringe whenever my sister was spoken to like a child. I hated the way my steps quickened when I slipped out of Wellspring, relieved to leave Deborah in her bed, nose to nose with her doll. Guilty relief to leave the shell that used to be my sister and go back to the riches of my life. We leaned in together, but it was my breath that put out the tiny flames. “Yea!” I said, clapping the way I did every time Deborah got out of the car without being pulled. “Yea!” Deborah echoed, a smile flickering across her face as she clapped with me. “That means your wish will come true,” I had said in my brightest, kindergarten teacher voice. Cringing as I heard myself treating Deborah like a child. As I raced away from Wellspring, glad to have her birthday–and the burden of trying to make it feel special–behind me, I wondered if she’d made a wish. I had. I wished I could make Deborah’s world right again. But like most birthday wishes, I knew it would never come true. When Deborah first starting doing things that alarmed us–repeating herself, getting into car accidents, perseverating about Mother Earth–my research was geared to finding out what was wrong and how we could fix it. Once Deborah was diagnosed with Frontotemporal Dementia, FTD, I searched for ways to maintain the quality of her life while keeping her safe. As Deborah grew more silent and infantile by the day, though, I found myself searching her face. Blue eyes, the right one still drifting center when she tired. Strong nose and jawline that used to photograph well. Smile with a faint crowding of front teeth that a seventh grade retainer failed to correct. The pieces were all there, but they no longer added up to the sister I knew. Something deeper was missing from her face, an elusive quality that was as hard to pinpoint as the essence that separated the Masters from lesser portraits. Deborah was alive, of course, but in a different way than she was before the FTD developed. I wanted to understand what was happening to Deborah’s brain. I wanted to know why her neurons began to die. I scoured websites from the major FTD research institutions: University of California, SanFrancisco; Harvard’s Massachusetts General; Johns Hopkins; Penn State. I read about DNA, chromosomes and genes, crash courses in genetics. I saw more references about what wasn’t known about FTD than what was. With apologies to those readers who left high school biology with a better understanding of genetics than I, this is what I learned. We are made of cells with blueprints–DNA–that tells our bodies how to grow and function. Genes are the part of DNA that give instructions for making proteins. Proteins are necessary for cells–for us–to survive. Genes send these instructions using four different chemicals grouped in sequences. Think of the chemicals as letters, the groups as words, and the sequences as sentences and you’ll get the picture. FTD is caused when nerve cells in the frontal and temporal parts of the brain degenerate. Scientists aren’t certain what causes these nerve cells to die, but when they autopsy brains of people suspected of having FTD (like Alzheimer’s, a definitive diagnosis can’t be made until the patient dies), they find abnormal build-ups of specific proteins, build-ups that may be caused by mutated genes. What my research can’t tell me is why the genes in Deborah’s started mutating in the first place. “Is it inherited?” people asked when they heard about Deborah’s disease. I heard the rest of their question–Are you going to get it, too?–though they never said it out loud. I looked at the statistical chances of Deborah having gotten FTD in the first place. She didn’t fall into the 10% strong family history of FTD group because our parents and grandparents didn’t have it. Then again, our father’s father and our mother’s mother both died before they might have shown symptoms of diseased brain cells. She could have fallen within the 20-25% group with some family history of neurodegenerative (brain cell) disease because our first cousin and her mother both had Alzheimer’s. Other aunts and uncles may have developed it as well, had they not died so young. But I needed to believe Deborah was in the 60-70% class of FTD, the group called sporadic. I needed to believe she was one of those people who got it out of the blue. I needed to believe that just because my sister was hit by a meteor, doesn’t mean one is going to strike me, too. No amount of speculation on my part, however, would change the following truth. Even if FTD had me in its radar, was at this very moment plotting to infiltrate my brain, I wouldn’t see it coming. I am Deborah’s voice. I am the archivist of her past and the puppeteer of her present. I am my sister’s keeper. I swing Deborah’s legs off the bed to jumpstart the part of her brain that used to be driven by motivation. “Let’s go to the park.” It is only when she is standing that the muscles in her face awake and she smiles, locking eyes with mine, registering who I am. She grabs my hands and pulls them chest high so she can lean into me, pushing so hard I have to step back with one leg to keep us both from toppling. “Do you want to dance?” I ask, adding a little bounce as I redirect her weight into a side to side motion faintly reminiscent to Betty Boop’s wiggles. I don’t understand this pushing game of hers, this ritual, and she no longer has the means to explain. Frontotemporal dementia has eaten the part of her brain that controls her words. FTD has taken another piece of my sister. Laurie, the red-head who is always laughing, sticks her head in the door. “You taking Miss Deb Deb out? I just changed her. Have a good one.” She disappears before I can even answer. When we come back, I’ll ask if Deborah needs more yogurt or jello from the store, sweet favorites to help trigger her swallowing mechanism during meals. It is a two handkerchief day in the park, one to wipe Deborah’s nose and the other to catch drool. Some days we don’t need handkerchiefs at all, somedays we need four. I choose a walk that has no stairs to play tricks on Deborah’s depth perception. It is too cold to wait at the top until her brain allows her foot to venture the first step, a step that starts an automatic sequence that will carry her to the bottom of the flight. Six months ago we were walking down stairs with little more than a reminder to hold the railing with the hand that wasn’t clutching mine. Six years ago, Deborah and I ran up and down the stairs to the beach in Santa Monica to tone our gluts. Now the only steps Deborah can navigate are ones leading up. In April 2009 when I cleaned out Deborah’s house, apologetically sorting treasures into piles that included Good Will and Trash, my sister–3000 miles away and blissfully ignorant to my treachery–played solitaire in an assisted living near my home. A zippered plastic bag, the thick, pliable kind that holds high-end blankets, caught my eye as I raised my face from the sad mounds of clothes. I stood on a build-in to reach it, stretching to slide it off the shelf. When it tumbled to the carpet, yellowed letters and notebooks spilled out of a split seam. My sister’s memories. Letters from summer camp. Diaries from junior high. Notes from high school boyfriends. Letters from friends as isolated and trapped as Deborah felt during long summers between college semesters. Journals of dreams, break-ups, and resolutions. A treasure trove that is now sorted into files sitting on the bed in the room where I write, a room where I examine the irony of fate. 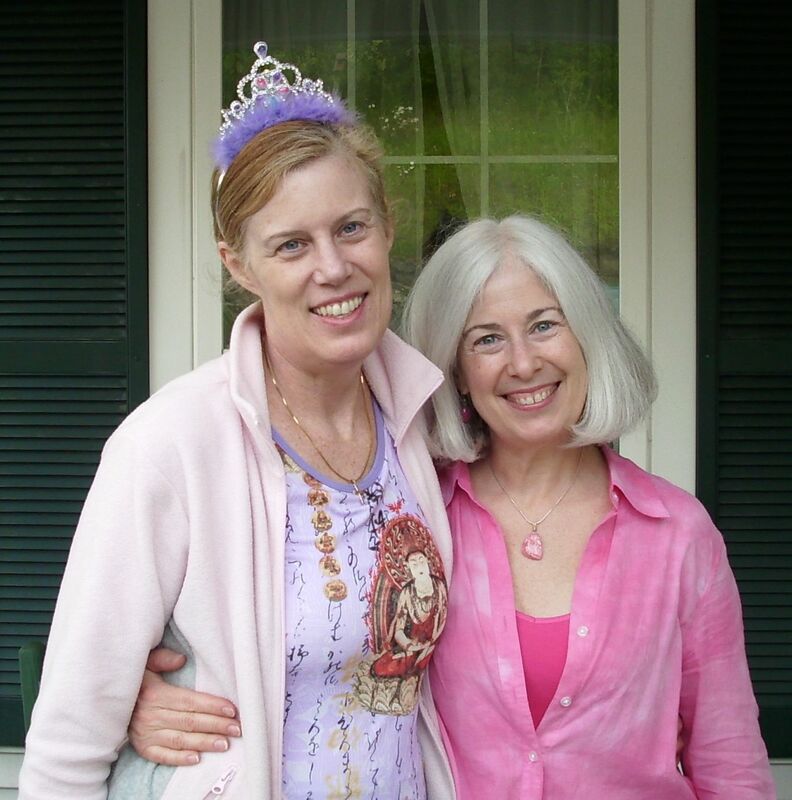 As Deborah’s archivist, I’m learning more about my sister, even as she is slipping away.